Some games require players to download and install first in order to experience the fun. Good thing, there are also games, which are flash or Java-based, that players can immediately play in no time! As long as you have an internet connection, you can enjoy online games without installing anything at the sites promoted on No Download Casinos. BetSoft is a well-established software provider in the gaming industry. The company offers great selection for both downloadable and flash-based games. Its collection of Java-based games is truly remarkable. The choices of Betsoft games range from the classic three or five-reel to video and progressive slots. Chances of winnings can be improved by watching out for wild and scatter symbols. There are also available cash outs in multiple lines and big bonuses. From the BetSoft homepage, all you have to do is click on the game you prefer and start the adventure. One of the most famous BetSoft games in flash-based is Mr. Vegas. This game, which has 30 lines, brings its players to the glamorous world of Las Vegas. Free spins, mini-wheel, and money wheel are among the promo feature of Mr. Vegas. From Las Vegas, Betsoft flies us to Paris with its new game titled A Night in Paris. Be sneaky in Europe as this game's theme lets you stole few expensive paintings from a museum. Scoring three or more painting symbols will let you trigger some bonus round. Greedy Goblins is another Java-based game that that can be played at Tropezia Palace Casino and will bring out the bad side in you. Sometimes, it is hard not to be greedy in this five-reel and 30-line slot because its bonus round can go up to 62,500 times. On top of it, there are also gold coin drops, free spins, sticky wilds, and more jackpots! If you want to turn back the time, maybe you want to try the 2 Million BC Game. Its theme gives you a glimpse on how the Earth looks like two million years ago. This five-reel machine will make you explore the jungle with great prizes. 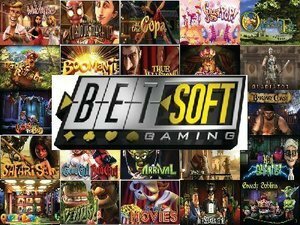 Other BetSoft games in line include Dr Jekyll & Mr Hyde, Once Upon A Time, Tycoon, Ned and His Friends, Sugar Pop, It Came from Venus, Mamma Mia, Treasure Room, Barbary Coast, Mad Scientist, Fruit Zen, Aztec Treasure, Heist, and Under the Bed. There are also plenty of different flash games to play at Besoft powered casinos.